#PEChat is a professional development opportunity for physical educators that takes place on Twitter. Every other week, teachers from around the world come together to learn, share, and grow as they discuss important topics in physical education. #PEChat is moderated by recognized leaders in our field via the use of Twitter’s hashtag functionality. Simply jump on Twitter during the next scheduled chat, search for the #pechat hashtag, and be ready to get fired up! Joey Feith is the founder of ThePhysicalEducator.com. 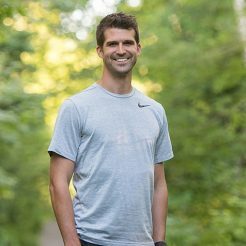 He currently teaches elementary physical education in Montreal, Canada. Joey created #pechat in 2012 in an attempt to build a social media-based professional forum that was accessible to every physical educator on the planet. Seven years later, #pechat attracts hundreds of teachers to its discussions and continues to provide physical educators with ongoing professional development that can be accessed from the comfort of their own homes.